The NHS is stretched in all directions, at national and local levels, in terms of staff and resources and across all types of care. ComRes data for the Independent on Sunday found that four in ten British adults say they or their family have struggled to get a GP appointment in the past 12 months, and over the last six months there have been regular reports of a lack of beds for emergency care, wrangling over pharmacy budgets, and crises in mental health care. Bad news for the public then, as recent data show that this year is even worse than last, particularly looking at emergency care. Compared to 2015, fewer hospitals are now reaching their target of seeing 95% of patients within four hours, as the below graph from the Royal College of Emergency Medicine illustrates. Indeed, only the other week 20 hospitals declared a Black Alert, while the British Red Cross claimed the NHS was heading towards a ‘humanitarian crisis’. 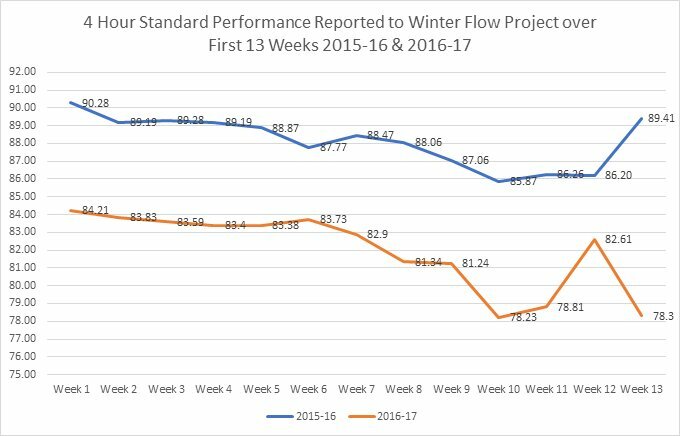 While some dismiss this as just the usual winter pressure, the year-on-year difference suggests that it is indicative of something more systemic. Given current headlines, it might be surprising to learn that when ComRes spoke to CCG leaders last summer, more said they expected demand for community healthcare services and mental health and learning disability services to increase over the next 12 months than said the same about emergency care. These expectations suggest the problem is systemic: the balance between acute care, community care and social care systems is a key element of the current ‘crisis’. Providing community care is essential to avoid patients ‘blocking’ hospital beds when they can be treated elsewhere. While the Government’s official line is that current challenges in emergency care are based on external factors of “extra pressures on the NHS during the winter” and “added pressures of the ageing population and the growing complex needs of the population”*, they are aware of the policy challenge here. The announcement of increases in council tax to help cover the funding gap for social care is one clear example. 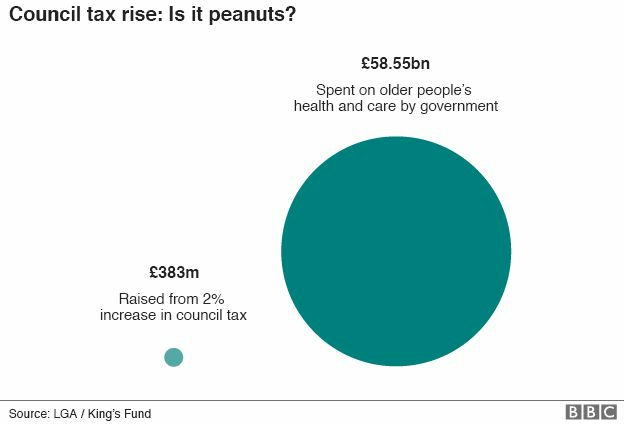 However, as the graphic above demonstrates, the increase in available funding represents a very small percentage of the total amount the Government spends on health and social care for older people, and it remains to be seen whether this will be enough to plug the gap. Theresa May is under pressure to avoid a return to ‘nasty party’ perceptions, and she is already struggling to persuade many that she is genuine in trying to help those ‘Just About Managing’. Recent ComRes poll data show that voters are more likely to trust Theresa May and the Conservatives than Jeremy Corbyn and the Labour Party with managing the NHS this winter (43% v 31%). However, that is doubtless as much a judgment about Labour’s own internal wranglings as it is about voter satisfaction with the NHS. With intensifying media coverage of both the growing emergency care crisis and an adult social care funding crisis, there remains scope for political turbulence ahead. *Theresa May, PMQs, Wednesday 11th January 2017.